What? 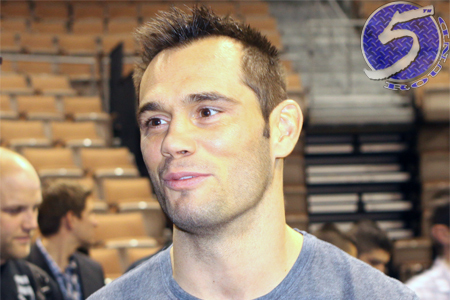 I thought Rich Franklin (pictured) retired from MMA years ago. Well, on Monday, the former UFC middleweight champion made it official. In a heartfelt blog post for the Player’s Tribune, Franklin said it was time to hang up his gloves once and for all. Franklin was last seen getting knocked out by Cung Le in November 2012. He had one fight remaining on his UFC contract, but Franklin was already well on his way to preparing for life after fighting. The former math teacher is currently serving as vice president for ONE FC, the largest MMA organization in Asia. Franklin is a true pioneer of the sport. He began his professional career in 1999 and became the UFC middleweight champion in 2005 by beating Evan Tanner at UFC 53. He defended the crown twice before losing to Anderson Silva, who went on to rule the throne for years to come. Franklin, 40, leaves the game with a 29-7 (1 NC) record.